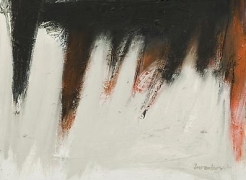 Signed and dated lower left: "T. STAMOS '49"
Titled, signed, and dated verso: "'THREE KINGS' / STAMOS / 1949"
Conventional wisdom holds that Abstract Expressionism burst onto the scene at midcentury like Athena from the head of Zeus: suddenly and fully-formed. 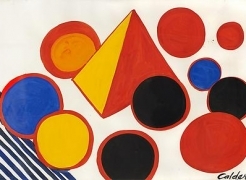 However, the signature gestures, expansive compositions, and flattened surfaces of the American Abstract Expressionists grew from roots in earlier, often European movements. By focusing on the 1940s, the group of works on view illuminates the aesthetic investigations that preoccupied the artists who would change the course of art history in the period just before Abstract Expressionism came to its full fruition. New York became a haven for exiled artists during the Second World War, and the most prominent of this expatriate group were the Parisian Surrealists. Their dreamlike compositions and emphasis on the aesthetic power of the subconscious led to explorations in sinuous line and fantastic imagery. 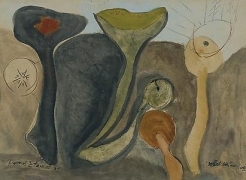 Artists such as Theodoros Stamos, WIlliam Baziotes, and Conrad Marca-Relli worked with Surrealist biomorphic forms that recall imagined sea creatures and strange humanoid figures. 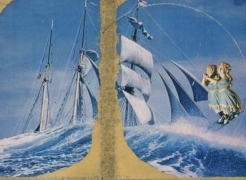 Joseph Cornell’s enigmatic boxes are deeply Surrealist in tone, and Robert Motherwell’s small untitled oil nearly resembles a Surrealist cadavre exquis -- a favorite game of the Surrealists that produces unpredictable hybrids. 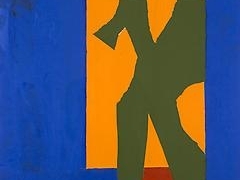 Here, Motherwell gives enough information to suggest figuration but ultimately leaves the composition willfully ambiguous, allowing the viewer to revel in his line, color, and form in their own right. A second powerful precedent for these American artists can be found further back in art history, in Cubism. 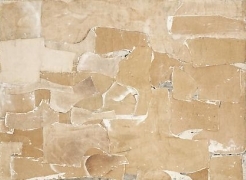 First practiced in the early 1900s by Pablo Picasso and Georges Braque, over the next several decades Cubism became an international force thanks to its dissemination via word of mouth, exhibitions, and the growing arts press. New Yorkers had ample access to Cubist work, which was shown prominently at the city’s young Museum of Modern Art. 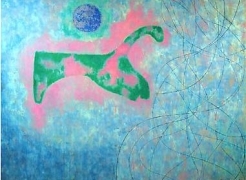 Jack Tworkov here adopts a cubistic style for his quiet still life, while Giorgio Cavallon and Adolph Gottlieb employ the organizing principles of the style to structure their own unique works. 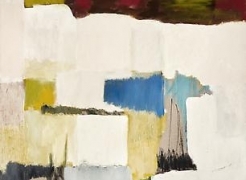 Cubism’s flattening of space also plays heavily into the later Abstract Expressionist emphasis on surface, as evident in Cavallon’s flat fields of abstract color. 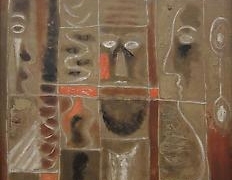 Each of these artists would go on to develop a bold and revolutionary style, yet the roots of later work can be found in this critical period during the 1940s, when smaller, more intimate compositions allowed the freedom to develop the received ideas of Surrealism and Cubism into highly personal and original aesthetics.